Got the wrong game, Gareth? England boss Southgate skips Manchester derby... to watch Super League! Peru agreed to throw a game against eventual winners Argentina during the 1978 World Cup in South America in order to help the hosts progress at the expense of Brazil, it has been claimed. They needed to win their second round game by four clear goals to reach the final at the expense of their arch rivals and promptly secured a 6-0 win. There have always been suspicions about the game which led to Argentina lifting the trophy by beating Holland 3-1 in the final. 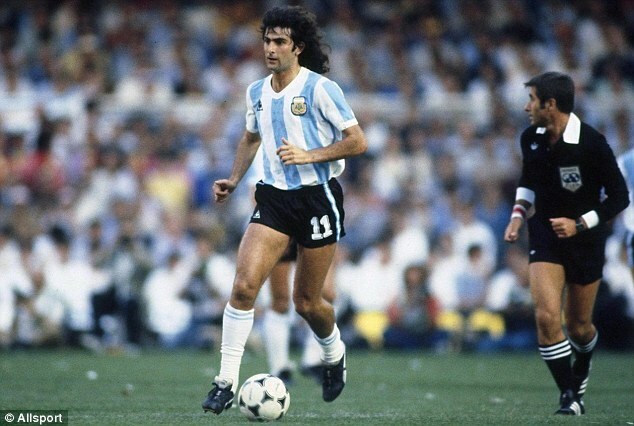 Match winner: Striker Mario Kempes scored twice in the final against the Netherlands, but should Argentina have even got through? Group B in the second round was a shoot-out between Argentina and great rivals Brazil. After the first round of games, Brazil beat Peru 3-0 while Argentina saw off Poland 2-0. The two South American giants then played out a tense 0-0 draw, leaving them both level going into the final game. Brazil then beat Poland 3-1, but because Argentina were not playing until later that day they knew they had to beat Peru by four clear goals to qualify for the final. Trailing 2-0 at half time, Peru collapsed in the second half and Argentina went on to win 6-0 and made it to the final in the Estadio Monumental, Buenos Aires. During the final, star striker Mario Kempes gave Argentina the lead, only for Dirk Nanninga to equalise for the Netherlands. With seconds left, Rob Rensenbrink hit the post and the game went into extra-time, before Kempes hit his sixth of the competition to win the World Cup for Argentina for the first time. But now former Peruvian Senator Genaro Ledesma has confirmed the shock result was agreed before the match by the dictatorships of the two countries. Mr Ledesma, 80, made the accusations to Buenos Aires judge Noberto Oyarbide, who last week issued an order of arrest against former Peruvian military president Francisco Bermudez. He is accused of illegally sending 13 Peruvian citizens to Argentina as part of the so-called Condor Plan, through which Latin American dictatorships in the 1970s cooperated in the repression of political dissidents. Once inside Argentina, the prisoners were tortured by the brutal military regime and forced to sign false confessions. Mr Ledesma, an opposition leader at the time, claims Argentininan dictator Jorge Videla only accepted the political prisoners on condition that Peru deliberately lost the World Cup match - and by enough goals to ensure Argentina progressed to the final. 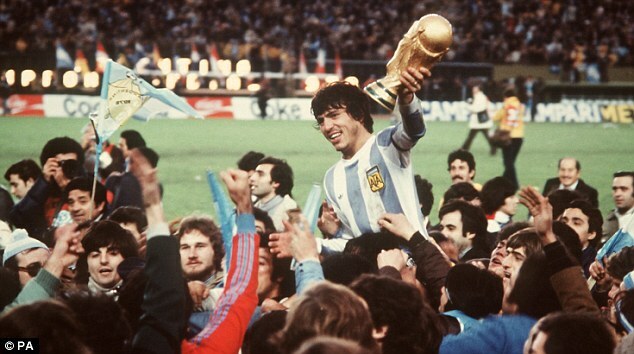 He said in court: 'Videla needed to win the World Cup to cleanse Argentina's bad image around the world. Group B in the second round of the tournament was made up of Argentina, Brazil, Poland and Peru. After Brazil beat Peru 3-0, then saw off Poland 3-1, Argentina had to win the game against Peru by at least four goals. They did so with a suspicious degree of ease, leading to rumours that Peru might have been bribed. 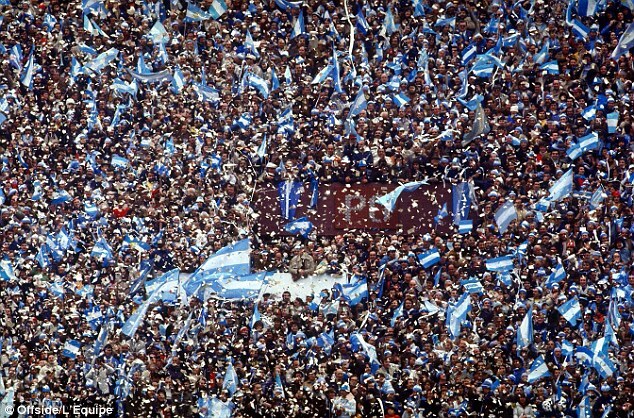 Other rumours claimed the beaten side had been offered a large shipment of grain to throw the match. Argentina caused controversy by delaying their games until the outcome of the other result in Group B, so they knew exactly what they needed to do before every match. Without their 1978 World Cup victory, Argentina would have won the tournament just once - the same as England, France and Spain. Joshua vows to beat Klitschko and take 'another step towards greatness' as veteran reveals his robe will contain fight prediction Over confident? Arsenal players in high spirits as they train ahead of Leicester... and who better than Pires to inspire them? Can member of the Invincibles inspire them? Liverpool legends of the past and stars of the present turn out in force for Leiva's celebratory dinner And Fernandinho turned up too! Schweinsteiger snubbed as Chicago Fire fan asks for picture with team... and gets him to take it! Don't you know he's a World Cup winner? Liverpool star Can takes on Manchester City rival Sane in blindfolded penalty shootout How do they get on with unsighted shots? Manchester United ready to sell David de Gea to Real Madrid for £60m... but who will replace him at Old Trafford? The worst Premier League sides of all time: As Sunderland edge towards relegation, who are the 10 most awful teams to compete in the top flight? Chelsea have won the FA Youth Cup six times in the past eight years... but how many of their talented academy graduates reached the first team?